It's time again for Secret Recipe Club (Secret Recipe Club) reveal! This month I got to choose a recipe from Kate's blog Food Babbles. What a great blog! She pulls together her love of food, family, photography and writing into one very enjoyable place to visit. I especially love the pictures of those adorable daughters of hers, but oh, the recipes! The hardest part of any Secret Recipe Club assignment is choosing a recipe. I thought about making these Zucchini Chocolate Chip Pancakes and the Lemon Biscotti, just to name a couple. I probably will make them in the future because they look so good, but I chose to make Rice Pudding Muffins this time. They just sounded like comfort food, and I guess that's what I was in the mood for. Isn't that how everyone decides what to cook or bake? In a large bowl, mix rice and butter. If rice is just cooked and still hot, you can use the hot rice to melt the butter, otherwise melt it in the microwave. Stir in yogurt and brown sugar and let sit for 10 minutes. Mix in egg, milk and vanilla. Mix flour, baking powder, nutmeg and salt and stir into rice mixture just until incorporated. Do not over mix. Fold in raisins. 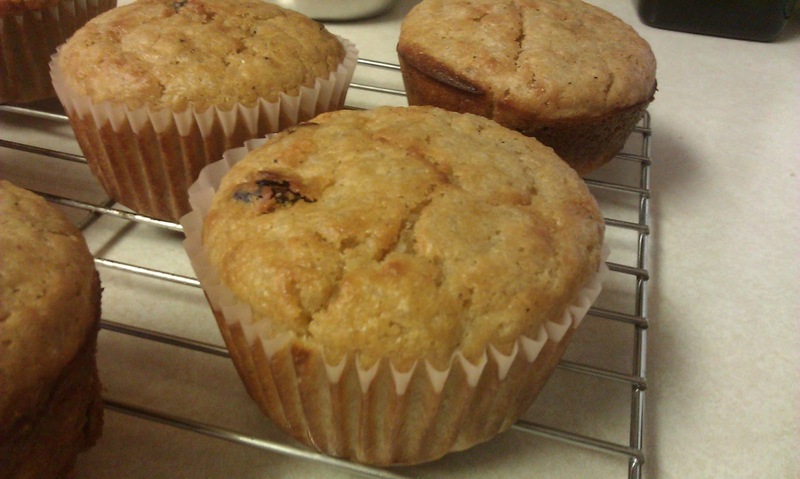 Fill greased muffin pan or muffin liners 3/4 full. Bake at 400° for 22-25 minutes or until lightly browned and a toothpick comes out clean. Cool for 5 minutes in the pan and then remove to a wire rack to cool. I never thought of putting rice in muffins. It really adds a nice texture. 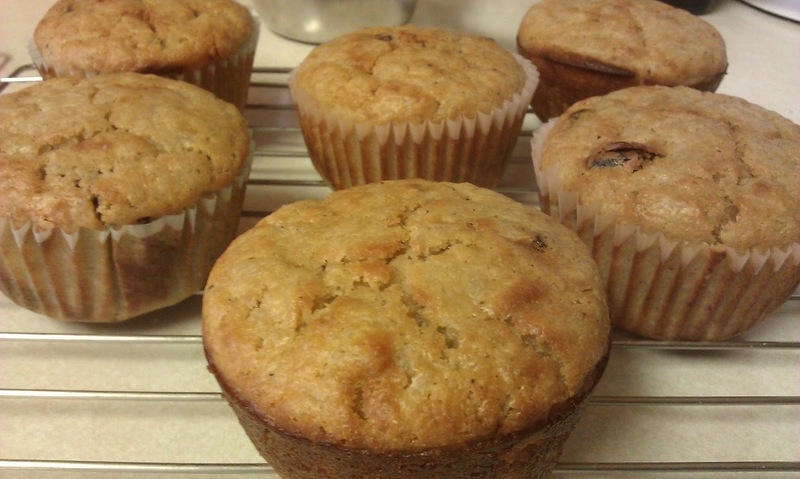 These muffins are really moist and have a very nice subtle flavor. I put raisins in only half of them because my husband thinks he doesn't like raisins. I think the raisins are very important, and he likes the muffins just fine without them. 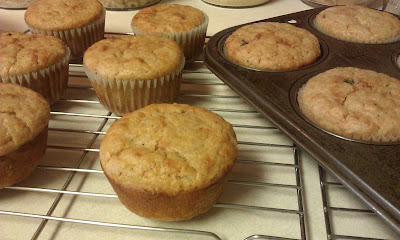 He said he still likes my banana muffins best, but he really likes these, too. I used yogurt instead of the heavy cream in Kate's recipe - because that's what I had. I also used brown sugar because I think it adds a nice flavor to things, but cut it down a bit so the muffins wouldn't be too sweet - and they aren't. Of the 1-1/2 cups flour, I used 1/2 cup white whole wheat because I like whole wheat flour in my muffins, but I think a traditional whole wheat would be too heavy and dense. Kate's recipe said to use muffin liners, but I usually like my muffins without them so I tried them both ways - with and without the liners. I like them better without because the bottom of the muffin gets browned, and I think it adds to the flavor of a muffin. They are good either way.